Within migration studies, it is common to encounter the distinction between internal and international migrations. The first is used to indicate individuals who move within the borders of a single country, such as circular rural-urban migration for instance, whereas the second is defined as the act of moving across international boundaries (transnationally) from a country of origin to a country of destination. Although the study of these processes constitute domains of research that have been developed as distinct fields, these two forms of mobility are related. Therefore migration scholarship should extend the analytical perspective beyond national borders and overcome the gap between internal and international population movements. From a phenomenological point of view, in many cases internal migration, which often relies on kin, religious or ethnic networks, gives rise to organisational solutions that prove crucial for transnational mobility. There is another important reason to keep in mind the internal-international nexus in migration studies: the protagonists of internal migration may be former transnational migrants and seemingly cosmopolitan transnationals may eventually end up in small, remote, rural areas. Moreover, cross-fertilization between the two perspectives is important from a methodological and conceptual point of view. 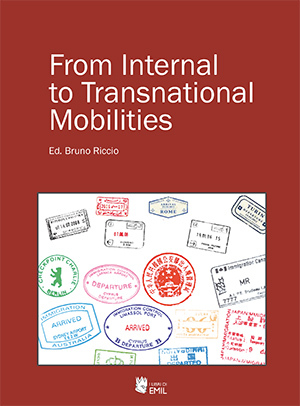 With the aim of enhancing the analysis of contemporary mobilities by transcending the division between internal and international migration theories and methodologies, this volume provides an initial discussion stemming from different research programs undertaken in different countries and from different disciplinary perspectives. Bruno Riccio (Laurea Politics Bologna; MA DPhil Social Anthropology Sussex) is Associate Professor of Cultural Anthropology and the director of the recearch center MODI (Mobility Diversity social Inclusion) at the Department of Education Studies “G.M. Bertin” of the University of Bologna, where he teaches Cultural Anthropology and Anthropology of Migration. His research interests include West African transnational migration, co-development, citizenship, mobilitiies, diversity, Italian multiculturalism and racism. Among his recent publications one counts the following co-edited volumes: Transnational Migration and dis-located borders (2010); Disasters, Development and Humanitarian Aid (2011); Antropologia e migrazioni (2014). Data di inserimento in catalogo: 26.10.2016.